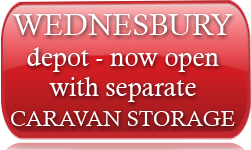 Low priced, clean and accessible business storage in the West Midlands. Our clean, dry and secure business storage units are ideal for small businesses who are short on space and need an inexpensive solution to their storage needs. Surplus stock, seasonal items, tools and equipment, , unused office equipment, whatever you can’t store we can. Whether it’s for a week or a year, Mighty Safe Containers has the right business storage solution for you. For more information on our range of self storage services covering the Walsall, Wolverhampton, Wednesbury, Dudley and Birmingham areas call NOW on 01922 646611 anytime day or night, and we will be pleased to give you a competitive quote.